If you're looking for a chocolate fix or small gift for Valentine's Day, I recommend Divine Chocolate White Chocolate & Strawberry, Milk Chocolate and 70% Dark Chocolate Hearts. I don't even really eat white chocolate but after eating one of the White Chocolate & Strawberry Hearts, I couldn't stop eating them! They are made with pieces of real strawberry crisp, added that extra crunch to its creamy texture. 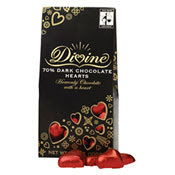 Divine Chocolate is made only with the finest quality Fair Trade cocoa beans from Kuapa Kokoo, a cooperative of smallholder farmers in Ghana. 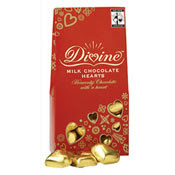 I've always found Divine Chocolate to be addictive, especially my favorite, the Milk Chocolate with Spiced Cookies holiday bar. 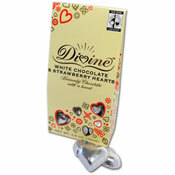 The chocolate hearts are available in a 3.5 oz. box for $6.99 at shop.divinechocolateusa.com.